Richard Griot, the owner and founder of Griot’s Garage, absolutely despises chasing power cords around the garage. Don’t we all?! That’s a thing of the past, thanks to the innovative detailing cart that Griot’s Garage designed and engineered. 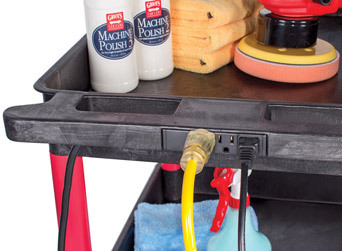 Not only will the Rolling Cart with Outlets make your life easier, but it will also make detailing more enjoyable! The three-tier design and cavernous 2 ¾” deep tub-style shelves hold gobs of gear, and the built-in outlets supply power for up to three power tools! Have fun in your garage! Built-in power outlets! That alone should make you want to pick up a Griots Garage Rolling Cart with Outlets for your garage or detail shop. Three fully-grounded, 15A outlets are built right into the push handle to provide a level of convenience you never thought possible. Ingenious! Three fully-grounded, 15A outlets are built right into the push handle! Griot’s Garage Rolling Utility Cart with Outlets is constructed out of High Density Polyethylene (HDPE) plastic composite. This robust construction ensures the cart will provide many years of service. The Rolling Utility Cart with Outlets is strong, durable, and light-weight. It won't stain, rust, scratch, or dent. Heavy-duty 4" casters make the cart easy to maneuver around the garage while a locking feature on two of the wheels makes quick work of securing the cart in place when it's time to work. Think about how much time you spend in the garage searching high and low for that power grinder, chop saw, or perhaps, your Griot's Random Orbital. Keep them in this cart where you can grab them fast and power them up in mere seconds. Measures 18" x 24" x 36 5/8" tall. Power cord is 14.5' long. Made in the U.S.A.